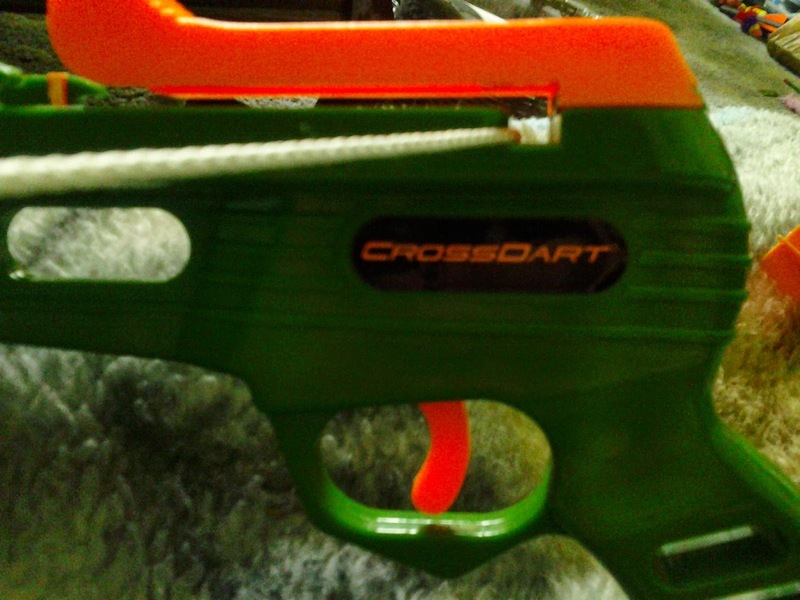 The Cross Dart is a shooting toy I've seen in various forms and places. Cracker Barrel, Amazon, Walmart, and now Toys R Us. After finding one on sale for $10, I decided to grab one and see how well it performed. I was pleasantly surprised! A little information: Westminster Inc. is a wholesale supplier of various toys and novelties. Not exactly where you'd look for blasters. The items are better than dollar store quality, at least. In the case of the Cross Dart, however, you have a solid plastic body, metal bow arms, and consistent performance. 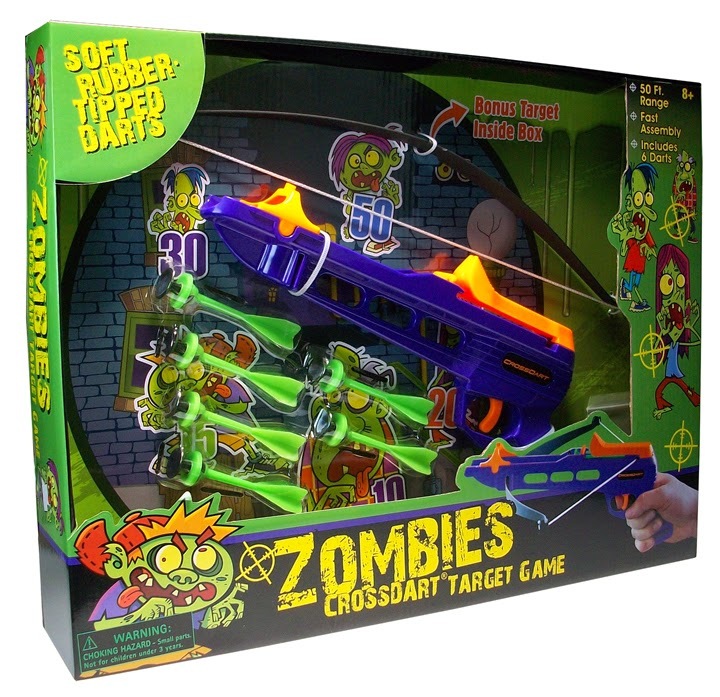 Depending on the version, the box may or may not have range claims, although it may mention a target shooting game with 20 ft. shots being "expert". Generally, however, 50 ft. ranges are the product claim. 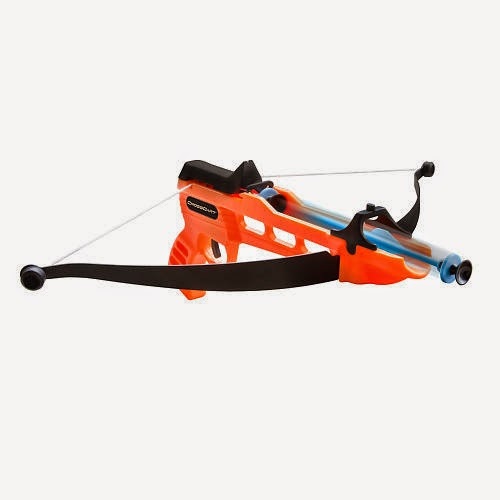 The TRU version is in the kid's sports and outdoor toy aisle, alongside the kiddie archery sets and sports balls. Usually, that's right beside the Nerf and Air Zone aisle. 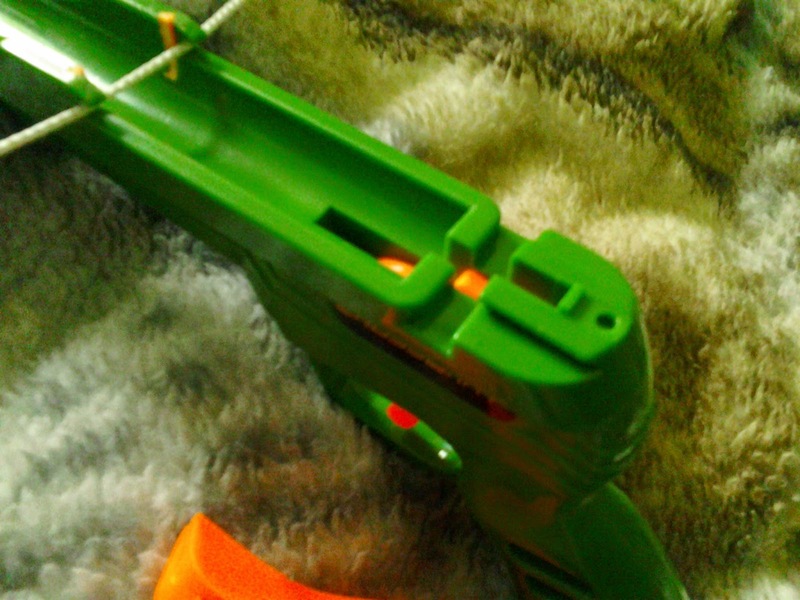 The toy is simple in operation: pull the string back, load a dart, pull the trigger. The bow arms store all the energy. The trigger simply lifts the string out of its groove. Since the bow arms are actually below the dart track in space, the orange cover (which can be easily slid off) isn't really needed. Are the ranges true? Surprisingly, yes. And these were parallel to the ground shots, to boot! Still, the plastic darts aren't exactly common ammo. What if they need replaced? 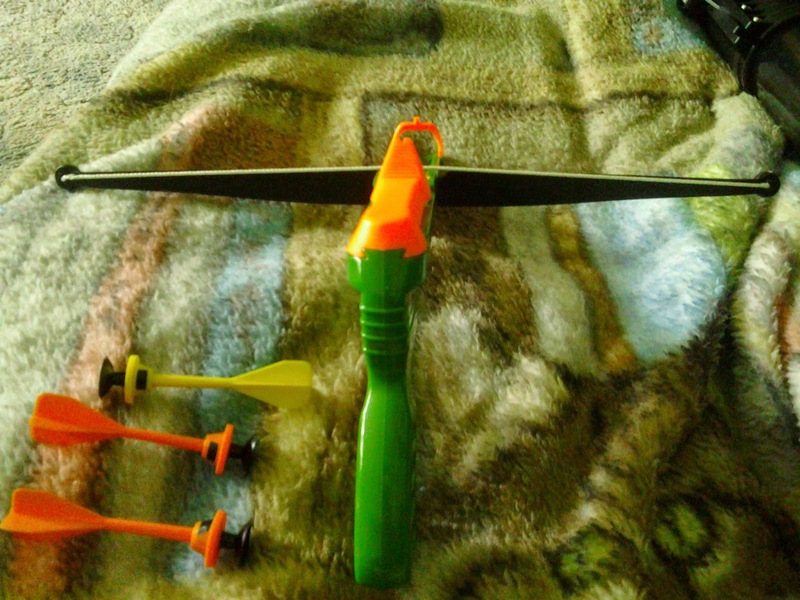 Yep, if you remove the square plastic piece for holding the plastic darts, Nerf Elite Megas fit perfectly! And in testing, they also got 50' ranges PTG. Assuming, of course, that they flew relatively straight (when does that even happen with Nerf's streamline-type darts?). In any case, it was lots of fun priming and loading the crossbow, firing the dart, and hearing it whistle the whole way toward its target. Note that you HAVE to remove the orange cover, if you don't plan on cutting a proper arc to allow the Megas to fit. Then again, not having your dart fall out while you're running is always handy. So I'd recommend making those cuts. The Cross Dart is a great example of an off-the-beaten-path blaster with good performance. 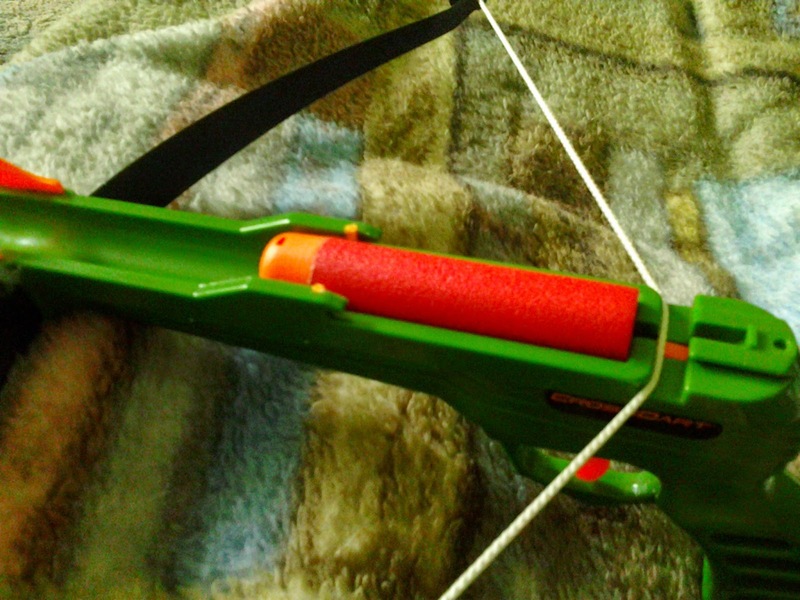 Even though it uses rare proprietary ammo, it can be made to fire Nerf darts. And it's not hard to find for only $10. Go ahead and buy one, and see what you can do with it. Perhaps it's better than the upcoming Rebelle Diamondista? Great toys collection ! awesome Thanks for sharing this post. Brilliant toy shot. Real awesome.